Novi is a city in Oakland County in the U.S. Start off your visit on the 9th (Fri): get outside with Seg Adventures and then tour the pleasant surroundings at Island Lake State Recreation Area. To see reviews, where to stay, other places to visit, and other tourist information, go to the Novi trip tool . New Delhi, India to Novi is an approximately 21-hour flight. The time zone difference when traveling from New Delhi to Novi is minus 10 hours. In August, Novi is slightly colder than New Delhi - with highs of 30°C and lows of 19°C. Finish your sightseeing early on the 10th (Sat) so you can travel to Amarillo. Known as "The Yellow Rose of Texas," Amarillo was once a series of ranches. Start off your visit on the 10th (Sat): explore the stunning scenery at Palo Duro Canyon State Park and then appreciate the extensive heritage of Lighthouse Trail. Get ready for a full day of sightseeing on the 11th (Sun): contemplate in the serene atmosphere at The Cross of Our Lord Jesus Christ, stop by Buffalo Gold/Herd Wear Retail Store, and then admire all the interesting features of Cowgirls and Cowboys in the West. For photos, other places to visit, traveler tips, and tourist information, go to the Amarillo trip itinerary builder . The Route module can help you plan travel from Novi to Amarillo. The time zone difference when traveling from Novi to Amarillo is minus 1 hour. Traveling from Novi in August, you will find days in Amarillo are a bit warmer (37°C), and nights are about the same (21°C). Finish your sightseeing early on the 11th (Sun) so you can travel to Yellowstone National Park. Discover out-of-the-way places like Artist Point and Old Faithful. Get outdoors at Upper Geyser Basin and Yellowstone National Park. Next up on the itinerary: witness a stunning natural landmark at Grand Prismatic Spring, explore the activities along Lake Butte Overlook, admire the sheer force of Gibbon Falls, and appreciate the extensive heritage of Uncle Tom's Trail. To find traveler tips, other places to visit, more things to do, and more tourist information, refer to the Yellowstone National Park day trip planning tool . Traveling by combination of flight and car from Amarillo to Yellowstone National Park takes 6 hours. Alternatively, you can drive; or do a combination of bus and taxi. Traveling from Amarillo to Yellowstone National Park, you'll gain 1 hour due to the time zone difference. While traveling from Amarillo, expect little chillier days and colder nights in Yellowstone National Park, ranging from highs of 24°C to lows of 3°C. Finish up your sightseeing early on the 14th (Wed) so you can travel to Las Vegas. Kick off your visit on the 15th (Thu): identify plant and animal life at Teton Raptor Center, then steep yourself in history at Mormon Row Historic District, and then contemplate in the serene atmosphere at Chapel of the Transfiguration. On the next day, take in the awesome beauty at Grand Targhee Ski Resort. For other places to visit, more things to do, maps, and more tourist information, refer to the Jackson Hole online travel planner . Drive from Yellowstone National Park to Jackson Hole in 2 hours. Traveling from Yellowstone National Park in August, expect nights in Jackson Hole to be about the same, around 7°C, while days are a bit warmer, around 30°C. 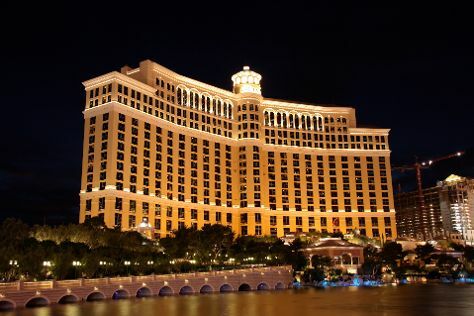 Finish up your sightseeing early on the 16th (Fri) so you can travel to Las Vegas. Kick off your visit on the 17th (Sat): take an in-depth tour of Titanic, try to win big at Bellagio Hotel and Casino, then take in the architecture and atmosphere at Guardian Angel Cathedral, and finally have fun at Battlefield Vegas. For photos, where to stay, maps, and more tourist information, refer to the Las Vegas online trip planner . You can do a combination of taxi and flight from Jackson Hole to Las Vegas in 5.5 hours. Alternatively, you can drive. The time zone difference when traveling from Jackson Hole to Las Vegas is minus 1 hour. In August, Las Vegas is much hotter than Jackson Hole - with highs of 45°C and lows of 29°C. Finish up your sightseeing early on the 17th (Sat) so you can travel to Ojai. Ojai is a city in Ventura County in the U.S. Start off your visit on the 18th (Sun): admire the verdant scenery at Ojai Valley Land Conservancy, then don't miss a visit to galerie102, and then do a tasting at Topa Mountain Winery. To find maps, more things to do, and other tourist information, you can read our Ojai trip planning tool . Explore your travel options from Las Vegas to Ojai with the Route module. When traveling from Las Vegas in August, plan for cooler days and a bit cooler nights in Ojai: temperatures range from 26°C by day to 19°C at night. Finish up your sightseeing early on the 18th (Sun) so you can travel to Incline Village. Incline Village is a census-designated place (CDP) in Washoe County, Nevada on the north shore of Lake Tahoe. On the 19th (Mon), trek along Tahoe Meadows Whole Access Interpretive Trail, then contemplate the long history of Thunderbird Lodge Preservation Society, and then stroll through Burnt Cedar Beach. To see maps, where to stay, ratings, and tourist information, use the Incline Village vacation planner . Use the Route module to find suitable travel options from Ojai to Incline Village. Expect somewhat warmer weather when traveling from Ojai in August: highs in Incline Village hover around 36°C, while lows dip to 14°C. Finish up your sightseeing early on the 19th (Mon) so you can travel to Mount Shasta. Mount Shasta is a city in Siskiyou County, California, at about 3600ft above sea level on the flanks of Mount Shasta, a prominent northern California landmark. On the 20th (Tue), take in the awesome beauty at Castle Lake and then glide through natural beauty at Mt. Shasta Nordic Center. To find reviews, maps, ratings, and other tourist information, go to the Mount Shasta trip itinerary maker app . Traveling by car from Incline Village to Mount Shasta takes 4.5 hours. Alternatively, you can fly. August in Mount Shasta sees daily highs of 37°C and lows of 12°C at night. Finish your sightseeing early on the 21st (Wed) so you can travel to San Jose. Carmel-by-the-Sea, often simply called Carmel, is a city in Monterey County, California, United States, founded in 1902 and incorporated on October 31, 1916. Start off your visit on the 21st (Wed): enjoy the sand and surf at Pfeiffer State Beach, admire the sheer force of McWay Falls, and then admire the majestic nature at Pfeiffer Big Sur State Park. Here are some ideas for day two: tee off at Pebble Beach Golf Links and then appreciate the extensive heritage of Pacific Grove Oceanview Boulevard. To find where to stay, photos, more things to do, and tourist information, read Carmel trip builder tool . You can drive from Mount Shasta to Carmel in 6 hours. Another option is to fly. When traveling from Mount Shasta in August, plan for little chillier days in Carmel, with highs around 24°C, while nights are a bit warmer with lows around 16°C. Cap off your sightseeing on the 23rd (Fri) early enough to go by car to San Jose. Deepen your sense of the past at sights like Pigeon Point Light Station and Cathedral Basilica of St. Joseph. You'll explore the less-touristy side of things at Big Basin Redwoods State Park and Golden Gate National Recreation Area. Get out of town with these interesting San Jose side-trips: Filoli (in Woodside) and Half Moon Bay State Beach (in Half Moon Bay). The adventure continues: pause for some serene contemplation at Our Lady of Peace Church. To see traveler tips, more things to do, and other tourist information, you can read our San Jose trip app . Traveling by car from Carmel to San Jose takes 1.5 hours. Alternatively, you can take a bus; or do a combination of bus and train. While traveling from Carmel, expect a bit warmer days and about the same nights in San Jose, ranging from highs of 31°C to lows of 18°C. Finish up your sightseeing early on the 26th (Mon) so you can travel back home.